Simple adjustment knob allows unit to spin both 7/8” (22 mm) and 5/8” (16 mm) diameter cable. Adjusts in seconds. 7/8” (22 mm) cable (C-10) cleans 2” to 4” (50 mm to 100 mm) lines through 150’ 45.7 m). 5/8” (16 mm) cable (C-7, C-8, C-9) cleans 1 ¼” to 4” (32 mm to 100 mm) lines through 125’ (38.1 m). A compact machine for institutional, commercial or residential cleaning. Also ideal for septic tank vacuum truck operators. Small enough to fit into cramped spaces, yet powerful enough to clear tough blockages. Ideal for rooftop vent stacks. Rear handle allows for easy transporting up ladders and onto rooftops. Remove only two bolts to access jaw set for cleaning or replacement. Removal of same bolts provides access to belt drive. Equipped with 1/2 HP motor. CSA approved. Approved to UL standards (NRTLC). K-60SP Sectional Machine is rated 5.0 out of 5 by 18. Rated 5 out of 5 by Plumco from Ridgid hit a home run with this drain machine I had a large General Drain Machine, that worked good, but was so heavy and bulky! The K-60 is easy to transport, in the house, outside, and very helpful when I need to get on a roof! Rated 5 out of 5 by PrairiePlumber204 from Have only used it one time so far but seems well built and very simple to use. I had used one years ago for a company I worked for. I had used mainly drum machines prior to buying this K-60. Except for using one a few time 15 years ago when I worked for a company that had one. This is much easier for one man to operate and worked well out to 150’ on a sewer that has a lot of root issues. Machine seems well built and simple to operate. I had a K-7500 drum machine which worked well but was a tank to move around. Too much for one person really. Plus the drum machine you have to be much more careful of torquing up and bending or snapping cables. The open wound cables and carriers will be much better to keep clean and in good condition than on a closed drum machine. I expect this machine to do a lot of work for me in the future as I have the 7/8 cables and the 5/8 cables for sink drains. Rated 5 out of 5 by AlanT from Best out there This machine is amazing. It takes some getting used too, but worth the effort. I am a one man plumbing service company, i no longer have to struggle with the weight of drum machines. I bought the root cutter and it works great. Best investment ever. Combine this with a rigid camera system and your set. Rated 5 out of 5 by DOMINATOR from EASY TO SERVICE THIS RIDGID SECTIONAL MACHINE IS VERY EASY TO CLEAN, LUBE AND SERVICE IN EVERY WAY. WE ALSO LIKE THE FACT THAT THIS ONE MACHINE CAN BE USED WITH 3/8" AND 7/8' CABLES. IT IS SMALL, BUT VERY POWERFUL; IN SHORT THIS MACHINE IS A WORK HORSE! 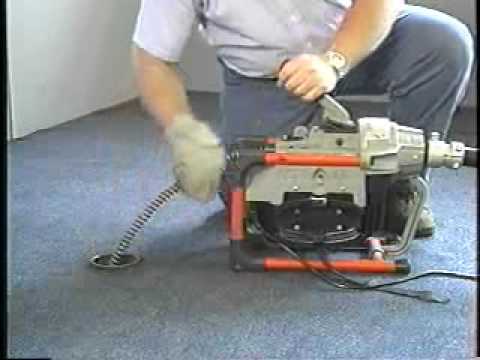 Rated 5 out of 5 by YorkDrain from Great Machine Lite, easy to use. Key things on the job. I can bring this into areas I can't fit a drum machine. And it has the power to cut through pretty much anything your going to get through without digging!